The RT7321 linear LED driver is designed for dynamically time- and segment-based driving in 220V/230V systems. This document describes the principles and methods for use of the RT7321 to provide guidance for initial use and references for LED lighting application engineers. 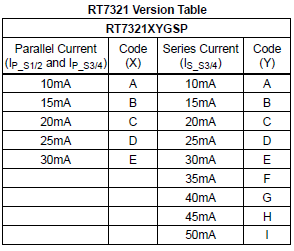 These methods and principles are also applicable to the RT7322, a version for 110V systems. 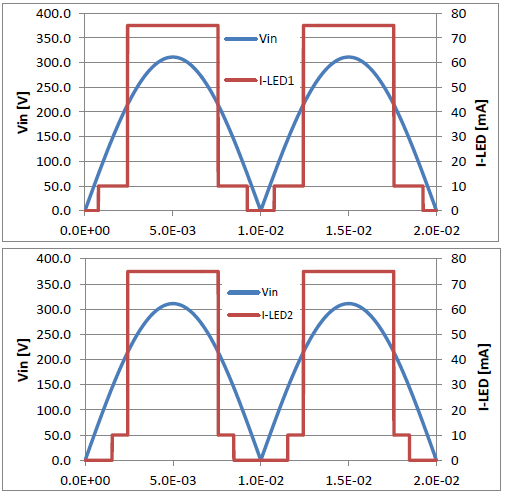 What challenges the most in design of an off-line LED driver is that the forward voltage of an LED is relatively constant, while the power voltage from the power grid is in sine wave. For this reason, most solutions are subject only to the switch-type conversion architecture with the function of changing the voltage. The linear drive is essentially to connect variable resistors and LEDs in series to share the input voltage. 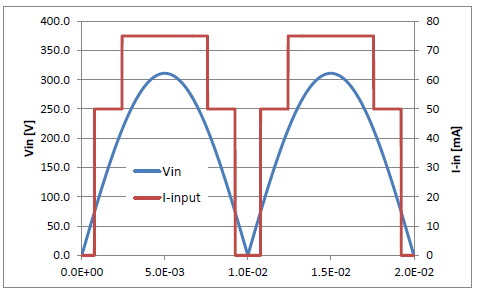 Simple use of the linear architecture may cause mismatching between the input and output voltages. When the input voltage is lower than the forward voltage of an LED, no current passes through the LED. Otherwise, a resistor or an equivalent device must be added to undertake the excessive voltage, from which the energy is completely wasted. This may give rise to current deformity, posing a threat to normal operation of the power grid. 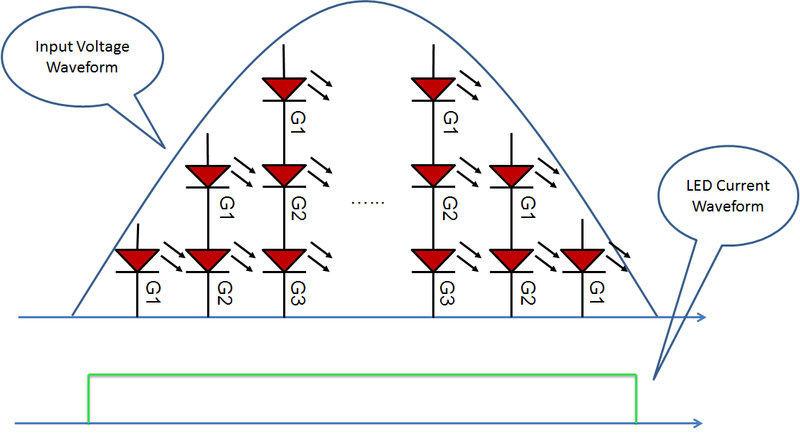 To take advantage of such a simple linear circuit, and maximize matching with the supply waveform in the power grid, the best method is to divide an LED into segments as many as possible, and timely combine different numbers of LED segments by different input voltage conditions for matching to minimize the voltage loss. In terms of current, different currents need to pass through the LED at different voltages to achieve a high power factor. Theoretically, we can obtain the nearly 100% conversion efficiency and the power factor approaching 1 in the case of infinite LED voltage and current segments. However, we can only make a compromise between performance and cost to achieve feasibility. As a result, the RT7321 comes out. Let’s see how to connect the circuits of the RT7321 in practice. As shown in the preceding figure, the voltage from the power grid, after being rectified, is added to the RT7321 which is subject to the PSOP-8 package. Therefore, no excessive pin is available. However, the LED is divided into several segments for separate use. This may be different from the use of the previous LED drivers. voltage applied on such a diode may cause severe power dissipation and low efficiency. Therefore, the high-voltage and low-current LED series should be used to lower the dissipation and improve the efficiency. However, the downside is that stable current can pass through the LED only when the input voltage is higher than the LED forward voltage and the minimum voltage drop of the constant-current diode. No current is output in other situations. Moreover, higher efficiency may result in longer time in which no current passes through the LED as well as a lower power factor. The constant-current source also involves detection of the voltage and control of switches K1 and K2. It determines the status of K1 and K2 based on the relationship between the input voltage VIN and breakover voltages of LED G1, G2 and G3. When the input voltage is higher than the breakover voltage of G1, and lower than the voltage of G1+G2, K1 is connected. The input current returns to the power supply via the G1-K1-constant-current source, and only G1 flashes. When the input voltage is higher than the breakover voltage of G1+G2, K1 is disconnected, and K2 is connected. The input current returns to the power supply via the G1-G2-K2-constant-current source, and both G1 and G2 flash, but G3 does not flash. When the input voltage is higher than the breakover voltage of G1+G2+G3, K1 and K2 are disconnected, and the input current returns to the power supply via the G1-G2-G3-constant-current source. We can see that the current fed to the LED always stays at the same value if the input voltage is higher than the breakover voltage of LED. As a result, the load in the power grid is a current square wave sequence (shown in the following figure). This is quite different from the current sine wave which we desire for. Is it possible to design the current waveform as follows? According to the above figure, the current waveform is more similar to the sine wave upon comparison with the preceding square wave. Therefore, the waveform can achieve the power factor more close to 1, and the RT7321 results from the attempt. In design of the RT7321, the LED is designed in four segments, which can be partially or completely connected in series or in parallel based on the voltage relationship. In each connection mode, the current can also be user-defined to provide a user with expected current waveform and fully use the LED. Proper design can also achieve the best result of correcting the power factor, and fully fit with LEDs at different specifications. 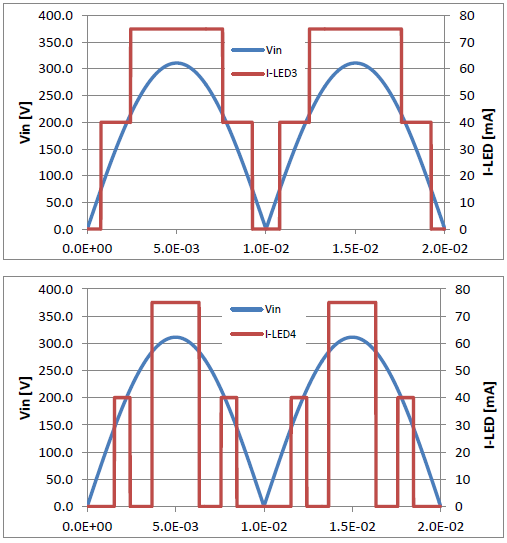 The following figure shows the voltage segmentation and LED connection, as well as traditional segmentation mode for comparison. The RT7321 is packed in two types. One is in the 5mm x 5mm WQFN-20L package, which features good thermal property and many pins, enabling a user to easily set the current value in each time span. The following block diagram shows the internal structure of a device in this package. HV—the power supply pin of IC, with the operating voltage of 1–400V, and the maximum allowable voltage of 500V. S1-S4—the input pin of the constant-current source, which is connected to the LED cathode. Each constant-current source works in a state based on the operating mode. It can work in the constant-current or cut-off state. The operating current of each constant-current source relates to two sets of data: the basic current of 10mA and the current increment which is determined by the connection mode at the relevant current setting pin. For S3 and S4, the current setting pin in series connection is different from that in parallel connection, and they are described in detail later. The settings of S1/2 are also different from those of S3/4. The former ranges from 10mA to 30mA, and the latter ranges from 10mA to 50mA. I11, I12, I13—the current setting pins of constant-current sources S1 and S2. When these pins are grounded, the current increases by 5mA, 10mA and 20mA respectively for these constant-current sources. I21, I22, I23—the current setting pins of constant-current sources S3 and S4 in parallel connection. When these pins are grounded, the current increases by 5mA, 10mA, and 20mA respectively for these constant-current sources. The settings also take effect in series connection, and can be used with the settings of I31-33 to form the series current. I31, I32, I33—the current setting pins of constant-current sources S3 and S4 in series connection. When these pins are grounded, the current increases by 5mA, 10mA and 20mA respectively for these constant-current sources. HV1— the output pin of the internal short-circuit switch. In parallel connection mode, this pin is short-circuited to the HV pin via an internal MOSFET. In series connection mode, this pin is connected to S2 via an internal diode. The RT7321 also involves the PSOP-8 package. Since this package is subject to a limited number of pins, the current setting pin is preset by jumpers in the package instead of being pulled out. 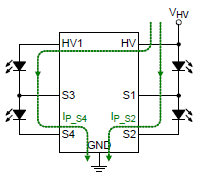 The specific setting relates to the selected model, The following figure shows the block diagram of the circuit. As shown in the figure, Sx corresponds to pins S1-4, and pins Ix1 and Ix3 can be construed as pins I11-33. The current fed into Sx passes through M1 and the resistor successively, and finally enters the GND pin to form the voltage VCS on the resistor. 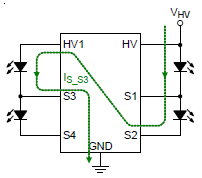 Then, VCS is delivered to the error amplifier for comparison with the reference voltage VREF. The comparison results, after being amplified, are used to adjust the grid voltage of M1 to ensure that the output current reaches the setting value. This is the same as the preceding constant-current diode, except that the current can be adjusted in line with the condition at your discretion. It is clear that ISx_SET is the current setting value of the constant-current pin Sx, and may change in different stages. For this reason, the value needs to be separately calculated. This value actually presents the internal resistance of MOSFET, and shall be concerned in the detailed design. Now let’s figure out how to use the segments of an LED, and provide the methods of setting and calculating the current in different operating modes. This is crucial to understanding the operating mode of the RT7321. I hope that my interpretation can eliminate your problems. First, let’s see the rectified voltage waveform. The half-wave in the figure is divided into eight time spans in the lateral axis and five voltage segments in the vertical axis. This arrangement is subject to the voltage instead of the time, and the voltage is the forward breakover voltage VF at each LED segment. Normally, the forward voltage VF of the LED and the voltage drop of the constant-current source are different in case of different currents. Therefore, it is impossible to accurately divide the half-wave via several integral multiplies of VF. We should know that this is only an ideal division, because the accurate analysis is a hard task. 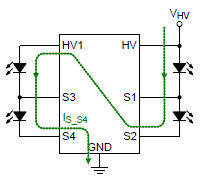 When VHV < VF, no current passes through the LED for the time span (t0-t1) regardless of the constant-current source. 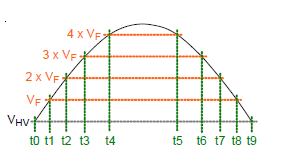 When VF < VHV < 2VF, the parallel connection mode is activated for the time span (t1-t2). HV and HV1 are short-circuited, the current passes through S1 and S3, and LED G1 and G3 flash. See the following figure. When 2VF < VHV < 3VF, the parallel connection mode is activated for the time span (t2-t3). HV and HV1 are short-circuited, S1 and S3 are cut-off, the current passes through S2 and S4, and all LEDs flash. See the following figure. Note that the current of S1/2 relates to the basic current I10 = 10 mA and I11-I13. When these pins are grounded, the current increases by 5 mA, 10 mA and 20 mA respectively. The current of S3/4 depends on the basic current I20 = 10mA and I21-I23. When these pins are grounded, the current increases by 5mA, 10mA and 20mA respectively. According to the previous formula, we can get the following table for calculating the current. In the table, Ixx is represented by 0 and 1. The value 1 indicates that Ixx is grounded, and the value 0 indicates that Ixx is floating. The combination of I11-13 in the same line provides IP-S1/2, and the combination of I21-23 in the same row provides IP-S3/4. The data obtained at the intersection of the lines and rows where the two combinations are located is the total current in parallel connection mode. When 3VF < VHV < 4VF, the series connection mode is activated for the time span (t3-t4). HV and HV1 are open-circuited, S1 and S2 are cut-off, S2 is connected to HV1 via an internal diode, the current passes through S3, and the LEDs G1-G2-G3 flash. See the following figure. When VHV > 4VF, the series connection mode is activated for the time span (t4-t5). HV and HV1 are open-circuited, S1, S2 and S3 are cut-off, S2 is connected to HV1 via an internal diode, the current passes through S4, and the LEDs G1-G2-G3-G4 flash. See the following figure. 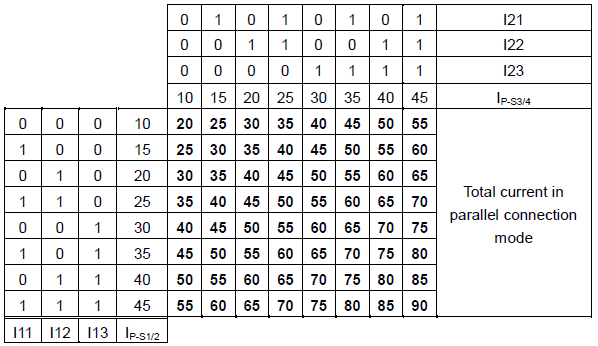 Being the same as the previous table, the bold data in the table refers to the total current in series connection mode. Only IS-S3/4+ should be concerned. The data in the row presents only the current increment arising from the combination of I31-33. 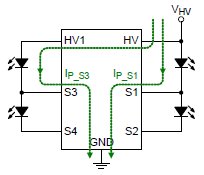 This increment always appears with IP-S3/4 in the total current, and cannot be separately measured. Due to the symmetry of the sine wave, the later time spans are similar to the previous ones, except that the voltage changes in different sequences. As a result, the connection and current value also change in a reverse sequence. The following table lists the preceding data for easy understanding and use. As shown in previous formula for calculating the current, IP-S1 = IP-S2, IP-S3 = IP-S4,and IS-S3 = IS-S4. 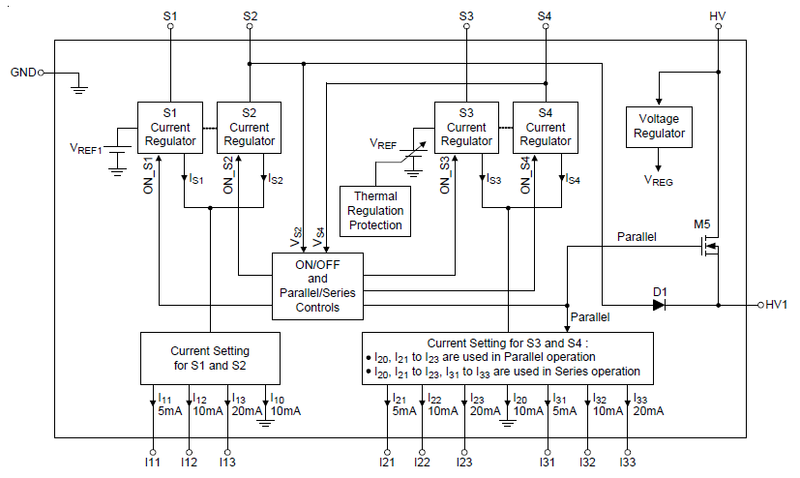 Therefore, we know the total current output involves only three levels, with one level being 0. In practice, only two levels are available for choice in the time span when the current passes by. The two tables for calculating the current are integrated as follows for easy use. 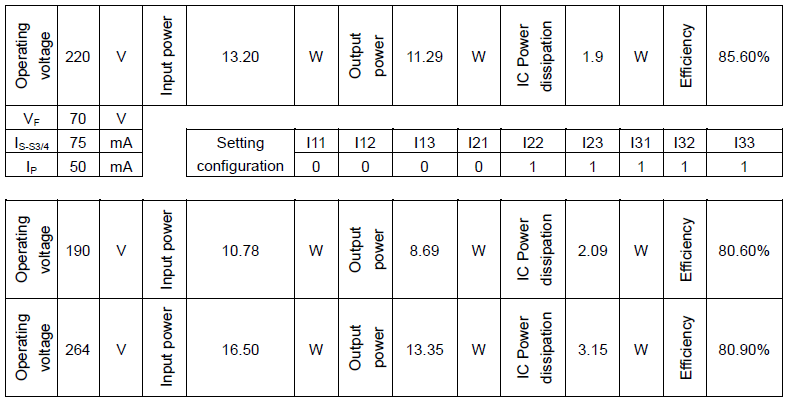 It is also possible to integrate these two tables, because IP-S3/4 can work in both parallel and series connection modes. 1. For the data of I11-I13, I21-I23, I31-I33 in the table, “1” indicates that the pin is grounded, and “0” indicates that the pin is floating. Fixed data: I10 = I20 = 10mA, I11 = I21 = I31 = 1 = 5mA, I12 = I22 = I32 = 1 = 10mA, I13 = I23 = I33 = 1 = 20mA. 2. The data obtained at the intersection of the horizontal and vertical lines constituted by I11-13 combination and I21-23 combination refers to the total output current in parallel connection mode. 3. The data obtained at the intersection of the horizontal and vertical lines constituted by I31-33 combination and I21-23 combination refers to the total output current in series connection mode. 4. The current unit is mA. It is difficult to answer how to choose the optimal current and VF. The linear driving system involves many variables. For this reason, we have not yet developed a complete and separate tool for assessing the potential problems in all circumstances. The calculation tool based on the time partitioning algorithm gives us a prompt that when the grid voltage is 220V, appropriate VF of single LED series is about 70V, and in such case, the conversion efficiency may be 86% or so. With the voltage deviates from 220V, the corresponding conversion efficiency may be continuously lowered. In any case, increasing VF can improve the efficiency, yet shorten the LED flashing time, which is similar with the case where the grid voltage is lowered at fixed VF, but the possibility of flashing is higher. Similar with reduction of VF, higher grid voltage experiences longer LED flashing time and lower possibility of flashing, but the response efficiency may be lowered. How to set the current? The LED specification is a primary consideration, thus we can firstly determine the maximum current of the LED, and use it as the current in series connection mode, shown as IS-S3/4 in the computational formula. Secondly, determine the total current in parallel connection mode, In my opinion, preferably such total current is slightly higher than 1/2 of IS-S3/4. This is because it is required to ensure that the final current waveform is as close as possible to the sine wave, and parallel connection mode occurs when VF < VHV < 3VF and series connection mode occurs when VHV > 3VF. If you don’t care about the power factor performance, or you face abnormal sine wave, you are certain to have other options, and it is all up to you. 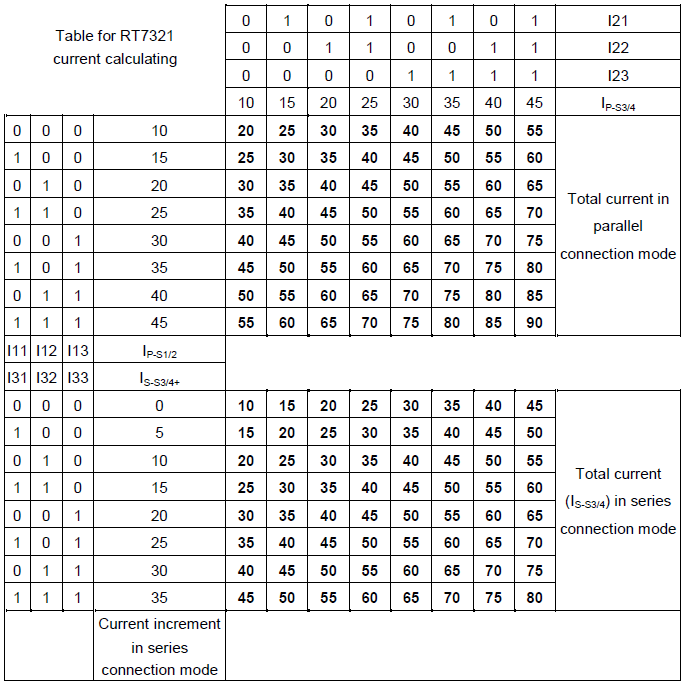 After the total currents in series connection mode and parallel connection mode are determined, we can find out such two data from the same row of the above computation table, and then determine the setting mode of I21-23 from such row as well as the setting modes of I11-13 and I31-33 from the line occupied by the two data. Please give preference to the data equivalent to IP-S1/2 and IP-S3/4, which can ensure that the two branch currents passing by in parallel connection mode are identical, and LED-related resources are fully used. Here that's all for the design of system configuration. 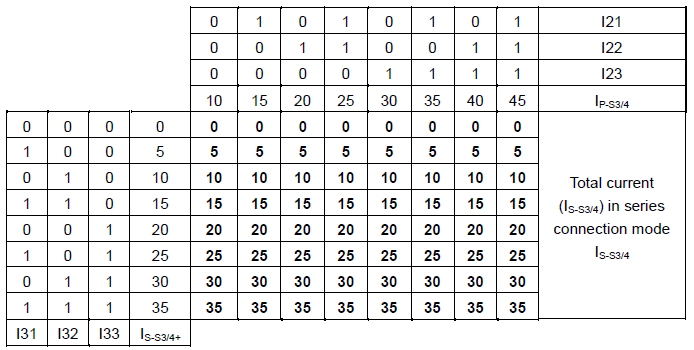 The following table shows one set of calculating data obtained by the above calculation tool. The upper part of the table lists the data under the standard voltage of 220V, and the lower part describes the performance under extreme voltages of 190V and 264V. How about this? Does it live up to your expectation? Maybe you wonder about the current passing through each LED segment, and the following figures may grant your wish. If you find certain performance is different from what you think, you should review relevant contents described above, and then have a look at here. You don’t have to be embarrassed, because I've been through it. After the above step, we need to determine the specific model of RT7321. Two questions shall be taken into account: Which package can bear the power dissipation during operation? Which package can meet the selected current configuration? This indicates that at the ambient temperature of 25°C, the PSOP-8 package can bear 3.44W power dissipation, while the WQFN-20L can bear 3.54W. Based upon our calculation example described above, the worst case is that IC power dissipation are 2.09W and 3.15W respectively at voltages of 190V and 264V, which means the two packages can meet these operating conditions. However, it does not means everything is all right. As we all know, the internal temperature of the LED is generally high. We assume the temperature is 60°C, can such packages still meet these requirements? Based on this formula, the powers which the two packages can bear at 60°C are 3.1W (PSOP-8) and 3.19W (WQFN-20L). Oh! Thank God! The power 3.19W is just larger than 3.15W above, indicating that only WQFN-20L package can be selected. This calculation process has no prearrangement, and I'm not going to make any change to start over, please accept the predestined arrangement and go on. Obviously, the RT7321 in PSOP-8 package selects the option that two branch currents are identical in parallel connection mode. This is much more reasonable than the previous calculation example. Please give preference to the package to avoid troubles in use of WQFN package. After package selection, the schematic design is a piece of cake, and we skip over it. I don't think any more details are necessary on the bridge rectifier. The current passing through the rectifier diode which serves as the linear driving circuit is identical with that passing through the LED. The high voltage is √2 times the maximum effective grid voltage, and inductance of the circuit is generally small, thus less additional voltage allowance is required. The waveform of the current passing through the LED is not sine wave, so the filter circuit may be considered in order to avoid excessive conducted interference. According to the test results provided by AE (application engineer), the following circuits are used. Where 220V/60Hz / IP = IS = 40mA, RRES = 50Ω, X-cap = 0.1mF, complying with requirements stated in EN55015. How about your detailed design? In case of any discrepancy, please use the same parameters first, and make adjustments during specific testing. I think it is very easy to pass the certification. With the X-cap added into the bridge rectifier, the design can be completed by using MLCC, and I think it's certainly worth a try on your part. Due to linear circuit, the PCB design is a no-brainer, leaving safety spacing and thermal dissipation the only concern. The thermal pad at the chip bottom is bound to have a good contact with the PCB, and its area shall be maximized to lower the thermal resistance. Meanwhile, avoid reduction in spacing due to the pin soldering tin. The copper trace of conductor shall be as short as possible to reduce unnecessary loss. The introduction to the RT7321 and description of its usage will come to an end, and I think the challenge lies in operating mode and current design. Please try to figure out it patiently, and you don’t find it any hard once you make it through. Another concern is how to configure voltage and current of the LED. I suggest that you could set parameters first based on the preliminary principles herein, and then give trial runs and tune them accordingly to establish a relatively perfect system. 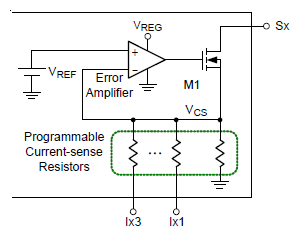 This paper describes the RT7321 on the basis of 220V/230V systems, and the same principles are also applicable to the 110V system, where RT7322 is recommended for design. Actually the 110V system is not my cup of tea, because it uses the current which is twice that of the 220V system to ensure the same power output, and all conductors are greatly enlarged to achieve the same resistance and loss. How deep-pocketed it is! Also, the RT7322 has to adapt such case. Its current setting reference is set to 20mA, and one more pin for setting series current is required to improve the current output capability, but all of these are costly. I’ll stop here, and if you have any other questions, you can send us messages or call us. Your valuable opinions will help us provide you with better services. Please visit http://www.richtek.com/LED/ for more about LED applications and other applications.